As a new business brought into the Leyland Holding Company with no company name, this was a big task for Stone Create to get stuck into. The client requested company name ideas, branding, website and other marketing materials, both on and offline. Extreme 14, born in Leyland, manufacture and supply silicone hoses for the car industry. We developed a website with a Magento backend (where they run the shop from) and a WordPress front end for the remainder of the website. This website had to be user-friendly, contain wide search parameters and professional photography. 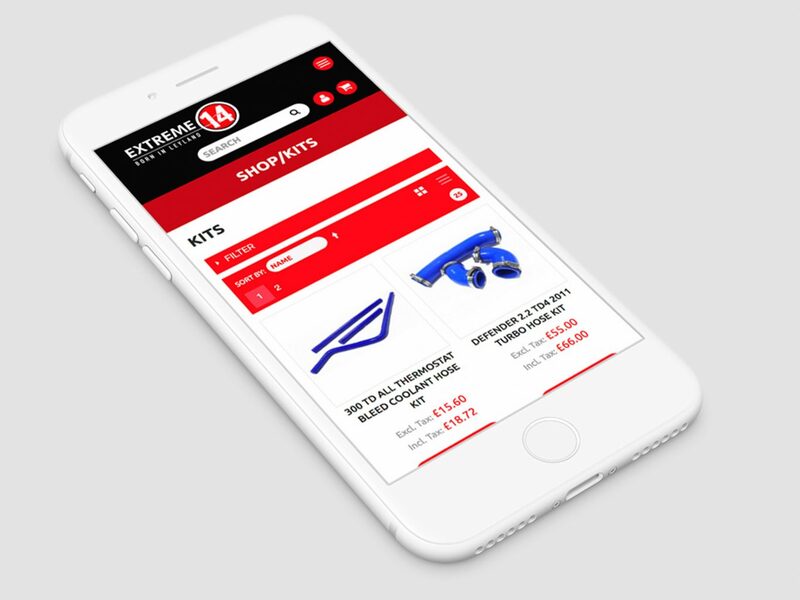 With hundreds of products and new lines being developed weekly for various different vehicle models, it was imperative that the client was fully trained in order to keep on top of the website, adding new products as soon as they became available. We knew that Extreme 14’s target market would be predominantly using a mobile device when searching for this product. The design of the mobile version was high on the list as this had to be perfect to allow for smooth transactions online. Here is a small selection of marketing materials that were produced for the company. This included; stationery, flyers and leaflets, email marketing campaigns, product packaging design and exhibition materials. All designs had a clean, crisp and professional look and feel to carry this new brand forwards.